of slightly compressed spherical form, freely incised on the exterior of the thinly potted sides with two rows of large petal lappets rising from the small knife-cut ring foot to the in-curved wide rimless mouth, the domed cover incised with a matching quatrefoil petal motif centered by a curling stalk-form knop, the hard white porcelain body covered with a creamy white glaze pooling in characteristic ‘tear marks’ around the base. A similar Dingyao jar and cover with engraved decoration of overlapping petals and with the character “guan” engraved on the base, now in the Shanghai Museum, is illustrated in Zhongguo Taoci Quanji: Dingyao, Vol. 9 (Compendium of Chinese Ceramics: Dingware), Kyoto, 1981, no. 6, and the same vessel is illustrated again in Zhongguo Wenwu Jinghua Daquan, Taocijuan (Compendium of Chinese Archaeological Treasures, Ceramics), Hong Kong, 1993, no. 276, p. 255. Other examples are illustrated by Gyllensvärd in Chinese Gold, Silver and Porcelain: The Kempe Collection, Asia Society, New York, 1971, no. 79, p. 92; and in Terre de Neige, de Glace, et d’Ombre: Quatorze siècles d’histoire de la ceramique chinoise à travers les collections du Musée Guimet, Taipei, 1999, no. 68, from the Calmann Collection. 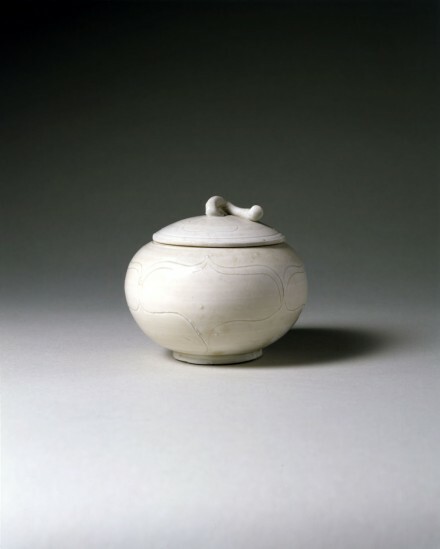 A plain Dingyao covered jar of this form is illustrated in White Porcelain of Dingyao, Nezu Institute of Fine Arts, Tokyo, 1983, no. 98, p. 67. Compare also the engraved Dingyao jar of this type lacking the cover, published in Illustrated Catalogues of Tokyo National Museum, Chinese Ceramics, Vol. I, Tokyo, 1988, no. 342, from the donation of Yokogawa Tamisuke, and another similar Dingyao jar without cover engraved with the character “guan” on the base, in the British Museum from the Oppenheim bequest, published by Vainker, Chinese Pottery and Porcelain From Prehistory to the Present, New York, 1991, pl. 69, p. 95.